Keeping it real so Four Stars, for me Assault Attack and Budokan only rank at 5 and I'm a huge fan going back to Force It days. The songs are much better, great melodies and some nice arrangements, Bonnet and McCauley are in great form, Gary is Gary and Dougie is good as ever. For me if sounds more like a Bonnet or McCaulay album (album!). Nice to include Kirk and if it helps raise the profile and self some albums thats cool. Michael Releases A Studio Album With His Past MSG Singers. Great see Michael releasing an album with his classic singers Gary Bardon, Graham Bonnet and Robin McAuley as well as with Doogie White. Guest appearance by Metallica's Kirk Hammett. How cool is that? I expected much more from this release, but to me it just is not that good!!! 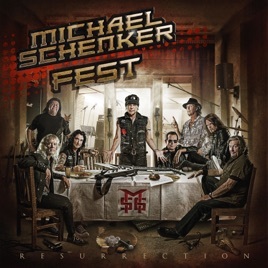 I'm a big Schenker fan, but this is not great by anymeans! !